Microsoft are set to release an update to their Windows Phone platform and it is expected to take the platform to the next level. One of the many features said to be coming in the Windows Phone 8.1 update is the ability to add a background image on the Start Screen, and a recent leak of screenshots shows just how this might work. From the birth of Windows Phone, Microsoft had never built in the facility to have a background image on the homecreen. This was probably due to how the tiles are arranged and the fact that 98% of the background image would probably be covered by the tiles themselves. 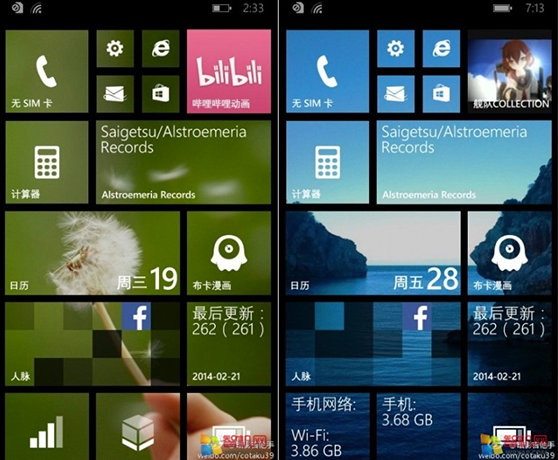 However, it seems that in Windows Phone 8.1, Microsoft have figured out a way of letting users have a custom image on the Start Screen, but also retaining the visibility of it to work with tiles. The option will allow a background image to be skinned over the tiles and effectively turn the tiles transparent, splitting the image amongst all the tiles on the Start Screen. The new customisation option is set to not be activated by default, and not every single App will allow its tile to be skinned with a transparent layer to make the background image visible. Apps such as Office and Xbox Music will not be automatically skinned in order to allow them to retain the ability to display custom colours as they presently do. With the right image, this option could look amazing, but with some Apps not allowing the background image to show, and instead choosing to show their custom colours, it could result in a very odd looking Start Screen to say the least. The images shown in the above leaked screenshot look pretty good, but get the wrong wallpaper and it might not work just as well as it appears. Let us know your thoughts about the planned wallpaper implementation in Windows Phone Update 8.1 in the comment section below.